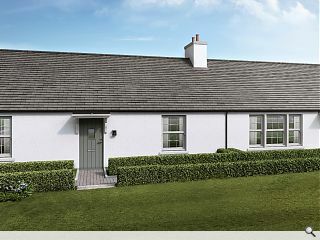 Elsick Development Company has revealed designs for a new range of 20 single storey cottages at Chapelton following feedback from customers and the housebuilder. Demand for accommodation on a single level has sparked the latest housetype, comprising a range of two and three bedroom single storey cottages, to complement existing properties delivered by AJC, Stephen and ZeroC. Tom Buchanan, marketing manager at Stephen, commented: “We are very pleased to bring a range of single storey cottages to Chapelton’s market and excited to see such a strong early response to the properties. Early phases of Chapelton have already seen delivery of 90 homes including a tearoom, nursery and beauty salon. Render makes it look nice, but the site photo shows it for what it really is - just another pastiche, ill considered developer estate to maximise sellable floor area.. Houses look out of proportion, too tightly packed and mean. The exception would be that little house by itself next to the silos which looks far more traditionally proportioned. 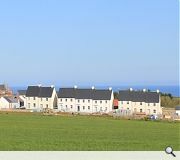 What are they referencing - doesn't look anything like traditional villages of Aberdeenshire where it is being built; nor the architecture of the west coast white houses, or the detailing and street layout of Fife and central 17th C. coastal villages. It's a Frankenstein development and doesn't really master any style. A shame as it could have been interesting. Good to have you back, Wonky. When did you go over to the dark side? By the way, I was thinking of something more akin to Chairman Mao, masel and his 'Serve the People'. It's a funny old game init, Saint? I like it. Ideally they'll have a bit of ground around them as Jon says.